Last week I went to a presentation at MIT made by a group of engineers that are half way through building a high technology barrier to protect Venice from rising waters. The project goes under the name MOSE (Moses). Venice is a city built on an island situated in a lagoon that has been artificially shaped by human intervention over the last 500 years. 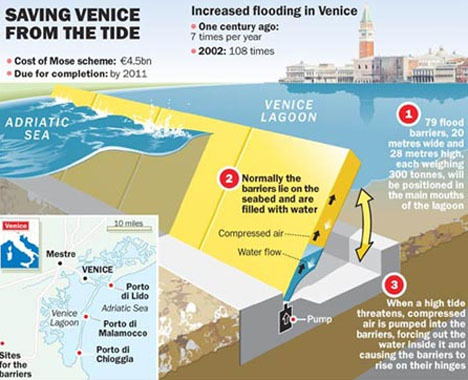 The problem of rising sea levels and storms has meant that the city is regularly flooded, and so the project is to build a barrier spanning the three large openings to the lagoon so that it can be sealed in times of high tide and storms. The flooding has been exacerbated by works carried out in the 1980’s and 90’s to build an industrial zone that involved the drainage of marshland areas, leading to a softening of the ground that made the city actually sink. 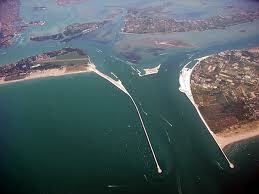 This is a 50 billion Euro project, and one of the biggest of its type ever attempted. A look at the data about the Thames Barrier (the first of its type) shows that the problem of high tides is getting worse. It was closed four times in the 1980s, 35 times in the 1990s, and 80 times since 2000, but why? Strangely enough the problem is related to global temperature rise as we might imagine but not so much because of the melting of the icecaps. The fact is that water expands when it is heated so warming even by a couple of degrees has the effect of increasing its volume. The International Panel on Climate Change state that 70% of the presumed rise will be due to this factor. So back to the barrier. The entire project is quite an undertaking as this YouTube video demonstrates. Years of planning followed by years of preparation, reclamation of marsh lands and sea defense construction not to mention the construction of an off shore oil terminal so that the ships no longer have to enter the lagoon. But Criticism is also rife. Some engineers criticize the project on purely technical terms, other groups point to the lack of environmental impact study and others the cost. This video also on YouTube tells a completely different story to the one above. Critics are arguing (amongst other things) that we do not know all of the variables involved (which seems to be true) and that the entire ecosystem of the lagoon will change. I am no engineer so I cannot argue about the choices made, but I do have one simple question. 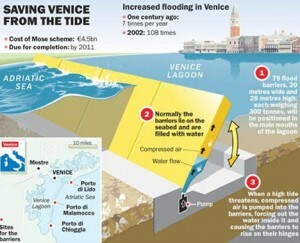 With all of the movement of water involved in this project (serious high tides and the passage of thousands of liters of sea water a minute) would it not have been possible to build something that produced electricity instead of consuming it in huge amounts? 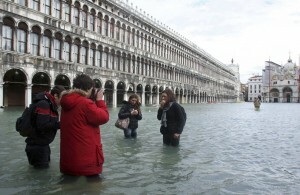 The stakes are high as you might imagine, Venice is one of the most touristed cities in the world, but the high tides are flooding the monuments ever more regularly. 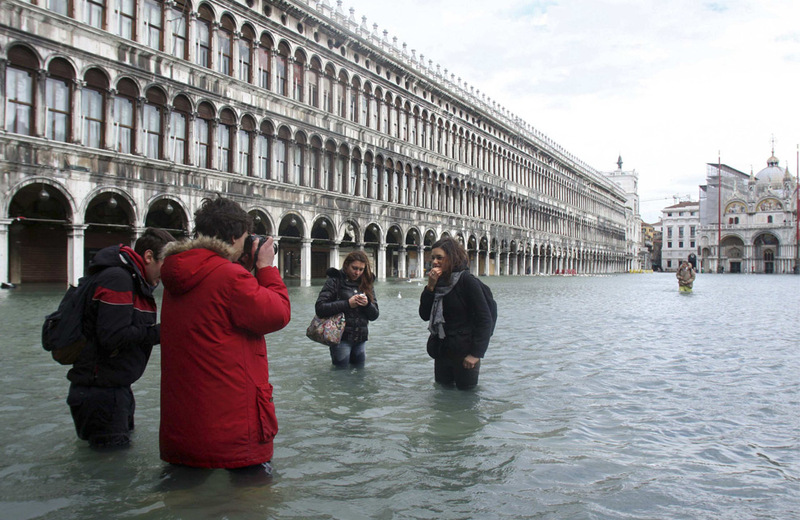 We are talking about more than a meter of water, and footage on international TV of tourists walking on raised platforms through St Mark’s Square and fresco covered churches full of water does not go down well. It is an old problem though, and one that is shared by many cities today. New Orleans is discussing a similar solution, and here in Boston the issue is also under debate. They are all looking for a high technology solution to an age old problem that is getting steadily worse. I would have to agree with you on the matter of finding a away to make something like this produce power instead of using it, but I am no engineer wither. It is projects like this that have such large budgets that have the possibility to innovate and try these things. This surely should be one of the goals involved. Fascinating article Jonny, really interesting stuff! I like the two videos, they are a bit slow to get to the point, but we can’t change that. I wonder whether the marine life will suffer. The EU have backed it on ecological grounds, so one would hope that it wouldn’t, but I am unsure. Is adaptation really the solution? Should we not try to mitigate the issue of climate change? Keep up the great work Jonny, I love reading your posts, as I am sure everyone else does. Your work is a credit to you and the blog! I agree that we should try to mitigate the problem but that will not be easy or immediate. Barriers and defenses are necessary if we want to slow down the destructive process in action. How to best do it is the question for me. Hi Jonny, I tend to agree with the skeptical bunch to some extent. Here in Sydney back in the 80’s and 90’s they put a port facility in Botany Bay and also extended an airport runway into the bay. Despite all of the environmental studies over the next few years a number of beaches were totally eroded and other actions were needed to correct the problems that they caused. Well there seems to be only one way to test out any model, and once the work is done and the action taken there is no going back. The construction of the industrial zone that I mentioned above in the article is another example, the result was that the city sank about 20 cm in relation to the sea. Bad planning or modelling again maybe but politics plays its role too. Wow, Jonny, just looked and this is your 100th ever comment! Well I think if somebody takes the time to read a post and write a comment then they deserve a response, so many of them have been replies to other comments.